Every other day for the past week, I have found a piece of Happy Mail amidst the usual bills and advertisements in my mailbox. 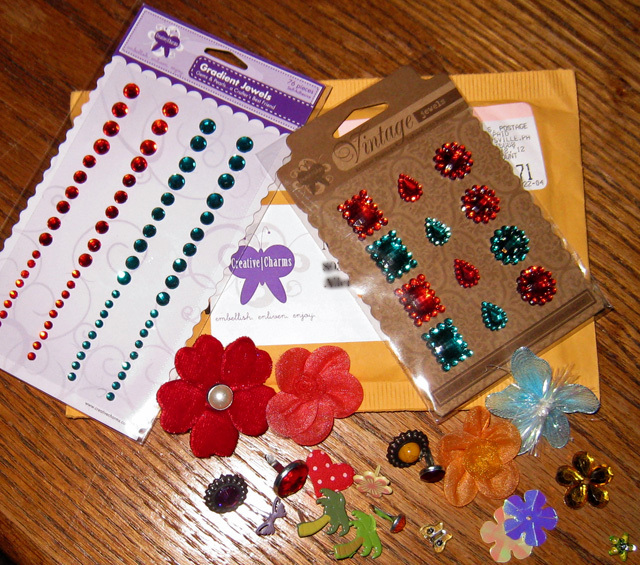 A classmate in the Twelve workshop, Midori, posted an offer on the message boards to send out a goody pack of embellishments from Creative Charms to the first 20 people who emailed her - I was number 4! 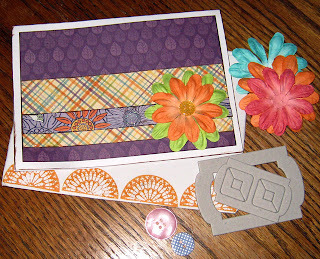 Then a lovely card and some extra embellishments arrived from Denise of Chocolate Mousie as part of Ginger's ongoing Mail Art Exchange. 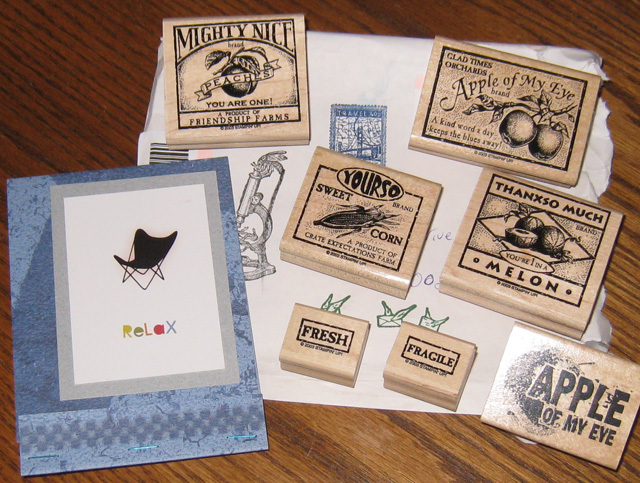 And then a package arrived from Rinda as part of her Stamp Giveaway. I was the lucky winner of the farm labels stamps. This was definitely a Good Mail Week! Over the past couple of weeks, I completed working through all the class materials in the BPC Reclaiming My Time workshop (which started back on December 1). 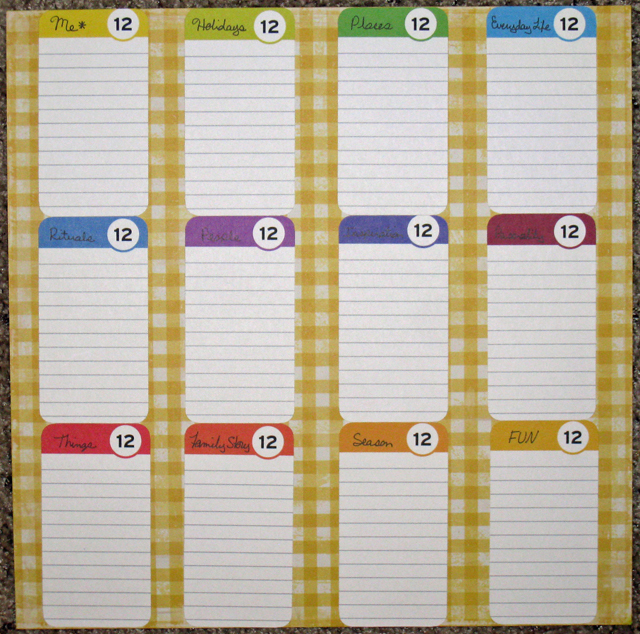 I filled out worksheets on How I Think I Spend My Time, How I Actually Spend My Time (which involved tracking my time for several days), How I Wish I Spent My Time, and How I Will Spend My Time in 2012. I truly enjoyed these exercises as they helped me define what I want to spend my time on this year AND how I will accomplish that. One of the main components of this class involved dividing the thing we do into group. I started out with lots of group, however after working through all the materials,combining groups, and adding new groups for things I'd like to work on this year, I ended up with 14 groups. I then journaled about how I will spend my time this year in each of these groups. (1) Maintain a deep connection with Robbie. I don't think we should ever take our most important relationships for granted, however I have to admit this will be my easiest goal because Robbie and I are so deeply connected already. (2) Lose 20 pounds. I believe this will be my most difficult goal, but one that I am determined to accomplish nonetheless. (4) Learn to use new DSLR camera. I'll be taking classes and lots of photos as I learn what all those little dials and settings can do! (5) Work through all paid for online classes. I'm sure I'm not the only one who has unfinished (or unopened) classes waiting to be completed, right? (6) Create an online class. I really like the way this workshop was scheduled and how it allowed us to work from how we THOUGHT we spent our time to how we ACTUALLY spent our time to how we WILL spend our time this year. 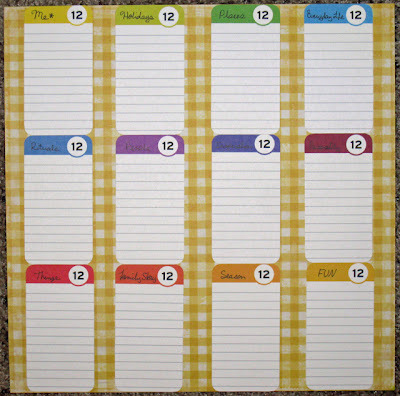 I'm looking forward to tracking my progress through monthly check-ins on the message boards. Anyone else take this workshop? Have you set specific goals for yourself for 2012? I was hopping through blogland today when I happened upon Shimelle's latest Starting Point. 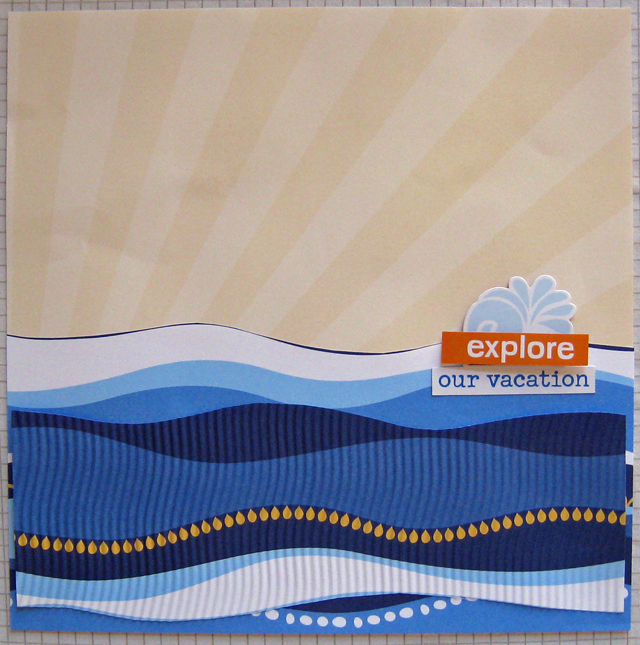 I had a photo and piece of cardstock on my craft table that I was planning to scrap next, but I didn't really have a layout design in mind yet. I knew instantly that the first starting point in Shimelle's post would work perfectly. I turned the sketch to fit the orientation of my photo and set to work. Of course, in my inspired state, I forgot to take a photo of the layout with just the starting point elements - background paper, a pile of patterned papers as the base for the photo, and a longer strip of patterned paper. I took this photo of Andrew while he was visiting last fall. I had it all planned that I would capture a great shot of him with these different sports balls all lined up, however he only stayed put long enough for this one shot! ALISON said . . . I love to write in our 'naya' which I believe is your equivalent of a 'sunroom'! Congratulations Alison! I have your address and will have this book on its way to you in a few days. I've seen several quotes from The Writing Life by Annie Dillard lately and the book has been mentioned on several message boards. This is a small paperback book (so it won't be expensive to ship!) 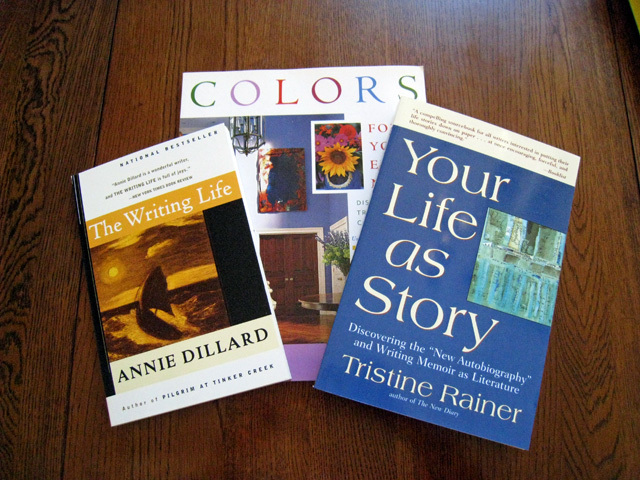 that contains stories from Ms. Dillard about the life of a writer. She describes the places where she's gone to write - from a small uninsulated cabin with a wood stove to a room in a library. The book is a quick read and an interesting perspective on the life of a writer. I'm not sure it necessarily encouraged me to write a book as I don't believe I could be holed up in one room with the blind drawn (to avoid distractions) for days and weeks and months on end! My dear friend Iris came over today and we spent six hours visiting and scrapping. Such a wonderful way to spend the day! I worked on those partially complete layouts that I started on our cruise. 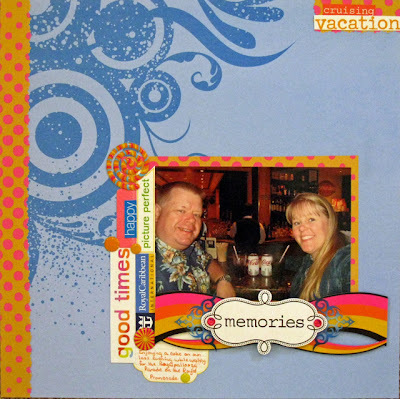 Although I mix different size pages in my Library of Memories albums, I've decided to use all 12x12 pages in our cruise theme album. 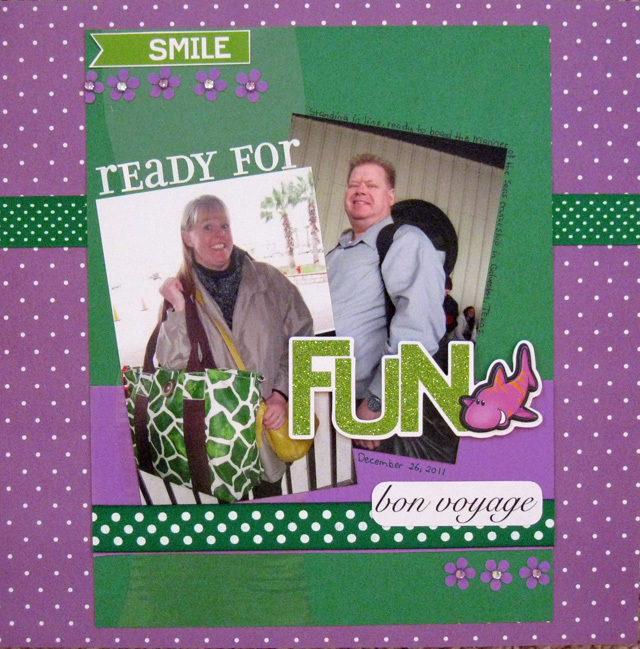 So, I modified this first layout from an 8 1/2 x 11 and added photos of us standing in line waiting to board the ship. 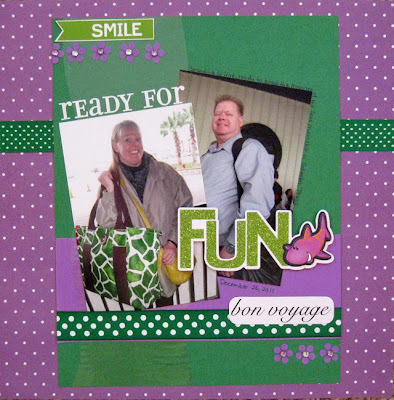 I also added bling to the purple flowers, two strips of ribbon, the bon voyage label, and white letters to make the title "Ready for FUN." 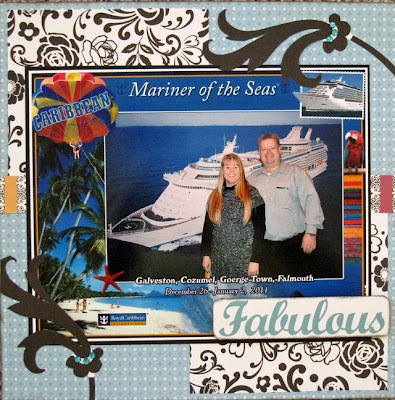 This next layout showcases one of the professional photos we purchased on the cruise. This photo was taken right before we boarded the ship. I had not adhered the black flower embellishments, so I adjusted them to work with the photo and added the Fabulous tag. 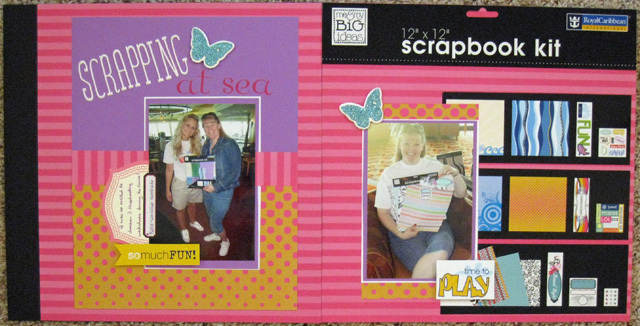 I turned the other 8 1/2 x 11 layout into a two-page layout and used the packaging from all three cruise scrapbook kits along with the photos of me enjoying those scrapbooking workshops. This is the layout that changed the most from what I put together during the cruise. 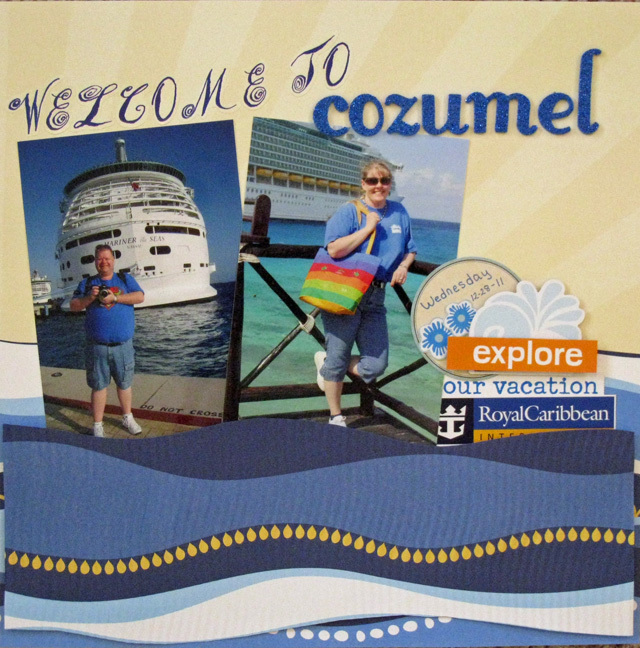 I used the layout with the water and crinkled paper for two of my favorite photos of us in Cozumel, Mexico. I added letter stickers for a title, a journal spot and a few other word embellishments. And finally a photo of us enjoying a nice cold can of Coca-Cola on the Royal Promenade as we waited for the Royalpalooza Parade to start. This is one of those "at-arm's-length" photos that I'm getting pretty good at taking (if I do say so myself!). I added additional words and circle embellishments to complete this layout. I'm excited about how colorful this scrapbook is going to be and am looking forward to scrapping the other 300+ photos I received from Shutterfly in yesterday's mail! 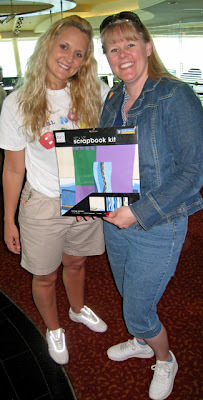 I'm slipping all those photos into a storage binder this evening so I can flip through and scrap as I'm inspired. As I perused the schedule for our first full day at sea on our recent cruise, I caught my breath and looked again to be sure I was reading it right. 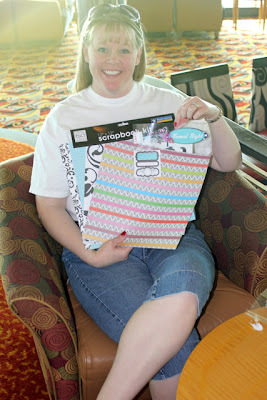 I wasn't sure what to expect as one of the cruise personnel began carrying in a couple of boxes of supplies. I was pleasantly surprised to find that a Scrapbooking Kit especially created for Royal Caribbean was provided with the workshop. As it turned out, there were a total of three Scrapbooking Workshops during the seven-day cruise, so I came home with three kits . . .
and five partially completed layouts. 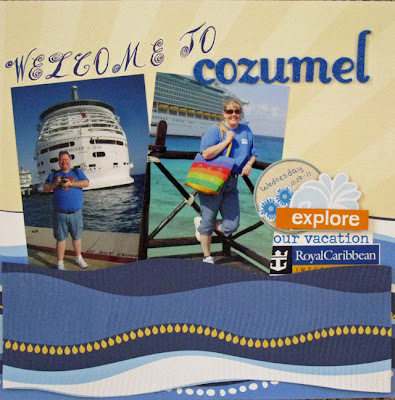 I am patiently anxiously awaiting a large order of prints from Shutterfly so that I can complete these layouts as I start on a scrapbook about our cruise. So, if you've been wondering whether or not you'll get to see some of the 800+ photos we took as we cruised the Western Caribben, you can rest easy . 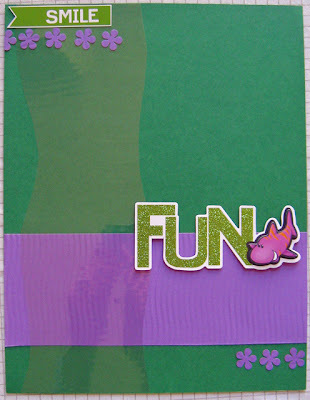 . . lots of layouts and photos coming soon! Today is Dozen Day in the BPC Twelve workshop and we received a handout with 12 photo-taking opportunities and 12 page-making ideas. We will receive a similar handout each month through 2012, and I've decided to try to take 12 photos based on the prompts each month on the 12th and post them here for your enjoyment (or amusement). 1. 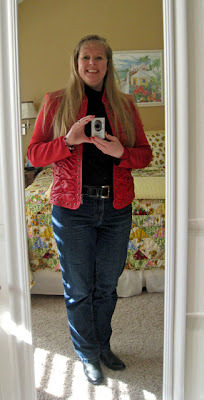 What You're Wearing - simple enough, an easy photo in the mirror look at me today. 2. 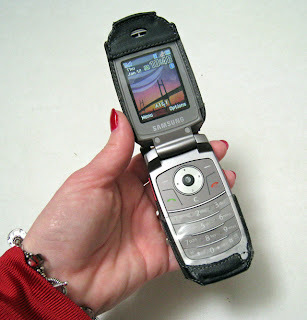 Your Cell Phone - the same phone I've had for the past 3 1/2 years; I think it's time to upgrade, don't you? 3. Three Things Together - three new books I purchased for storytelling and scrapbooking inspiration. 4. 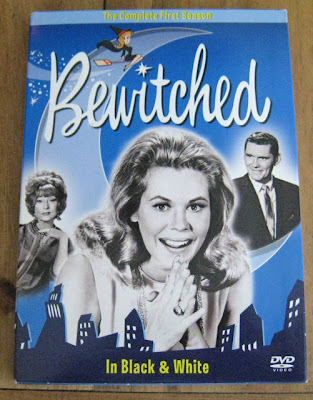 Something Blue - this DVD set is one of my Christmas gifts from Robbie. We've been enjoying an episode each evening this week. 5. 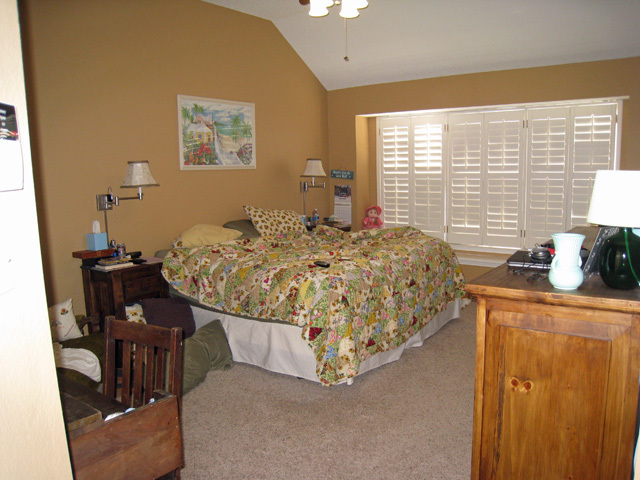 A Bedroom (before you pick it up) - luckily I'd already thrown the quilt over the bed in a haphazard fashion before reading this prompt so it doesn't look too bad! 6. A snack - just a little snack today as I'm trying to eat less. 7. 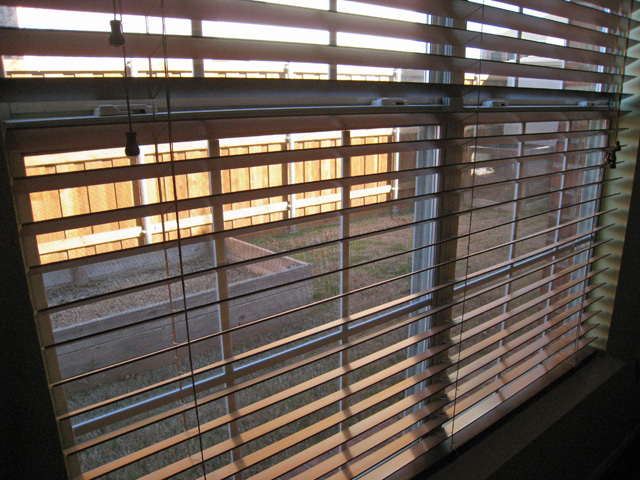 The View Out A Window - looking out to our very barren raised garden bed. 9. 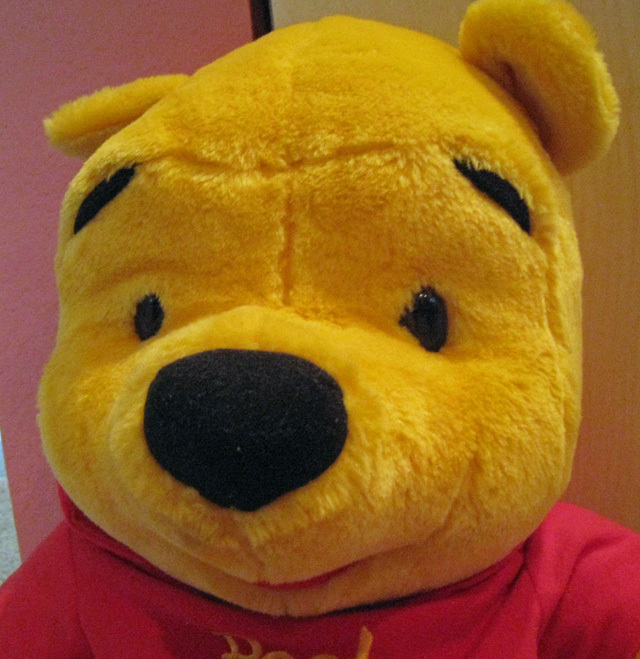 A Smile - Robbie's collectible toy room makes it easy to find something for almost any prompt. 10. 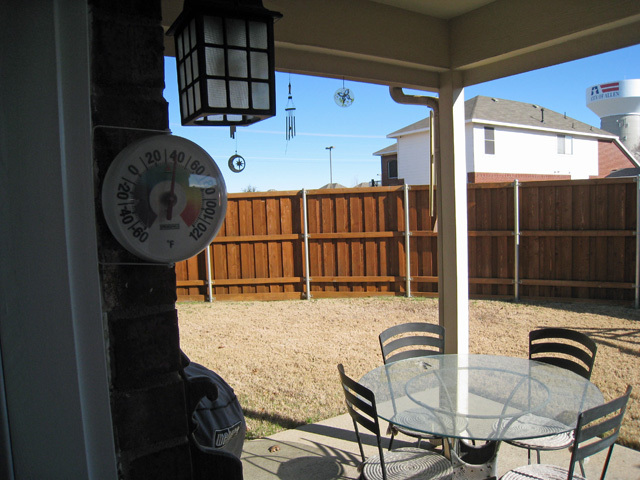 Weather - a beautiful sunshiny but very cold day here today. 11. 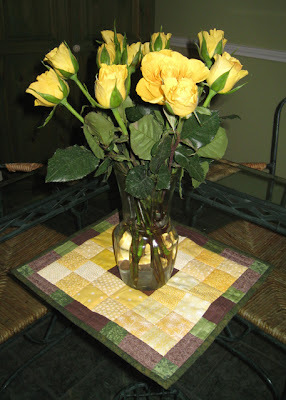 Homemade - the little square quilted "rug" on the table was made especially for me by Pun'kin, all by herself. It was my Christmas gift this year, and I am so thrilled that she shared the first thing she completed by herself with me! Isn't it beautiful? 12. Shoes - looking down a little later in the morning, I found my shoes! I've seen other prompts/inspiration/ideas for taking 12 photos on the 12th of each month this year - are any of you participating in those challenges? Have you taken your 12 photos today? I can hardly believe it's the tenth of January already. It has been a busy beginning to the new year. I am looking forward to a wonderful 2012 and have lots of plans & goals for the year. Here are ten of the top items on my list. 1. Stacy Julian's Twelve workshop has begun at BPC. 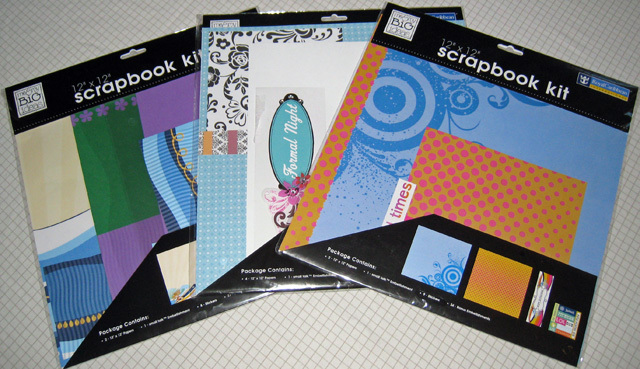 We are gearing up to create 144 inspired layouts in 2012, all designed around twelve categories. This workshop include a ton of material and inspiration - 24 inspirational emails each month, 12 Triggers to spark our inspiration on the first of the month, Dozen Day on the 12th where Stacy shows us her 12 layouts for the month, and one Storytelling Feature each month to help us become better storytellers. I've created a layout to track my progress in this year-long class. 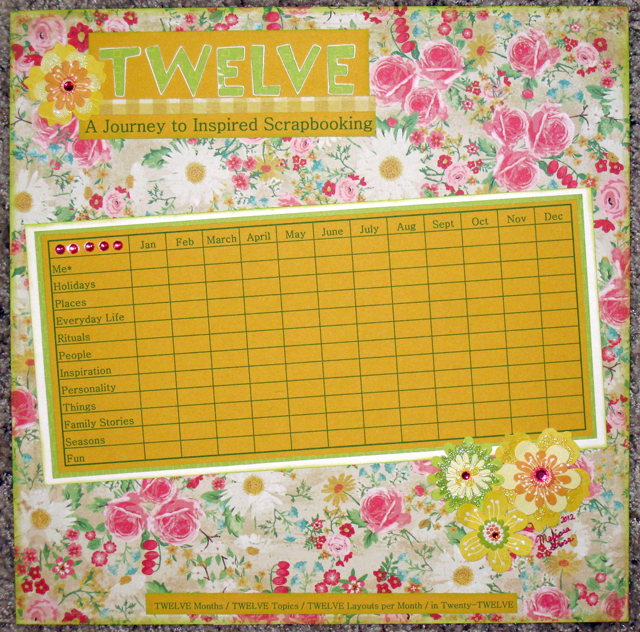 The front of the layout contains a checklist similar to my September 2011 Goals layout. 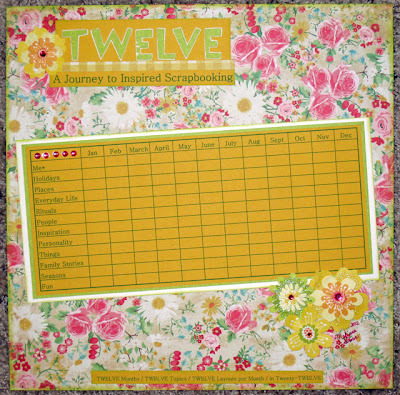 The back of the layout includes 12 topic lists where I'll record the titles of the layouts I create. 2. I'm also in Cathy Zielske's Move More, Eat Well workshop. In all honesty, I've barely had time to look at the material for this course which started on the first also. However, from what I've read so far, this year-long workshop will be a wonderful way to stay motivated in my ever-continuing quest for a healthy lifestyle. Robbie and I have both set some goals for ourselves this year, with rewards along the way. 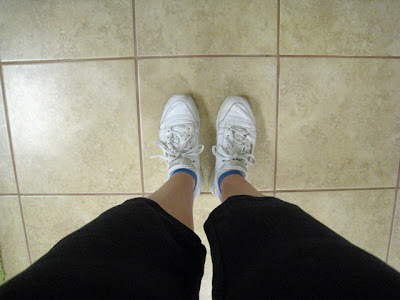 We both began exercising (again) when we returned from our cruise on the 2nd and are concentrating on eating smaller portions. We each set three weight goals for this year and our individual rewards will benefit both of us. For example, when I hit my first weight goal, I am planning to sign up for a photography class (see item #4 below). Robbie already knows quite a bit more about photography than I do, however I'll be sharing all I learn with him as we play with our new camera. When Robbie hits his first weight goal, we are going to take golf lessons together. It's something we've both wanted to try for a while. I'm excited to see how we do and will be keeping you updated along the way. 4. I will be taking Photography Classes this year so that I can learn how to use our new DSLR camera and become a better photographer. I'll be looking to sign up for my initial class once I reach my first weight goal for the year (probably sometime in March/April). Please let me know of any classes you would recommend. 5. I will continue to pass a book each month through July as part of Pass the Book:Year Two. There are a couple of chances to be the next recipient of a book right now - click here and scroll to the bottom of the page to find out where the books are now. 6. 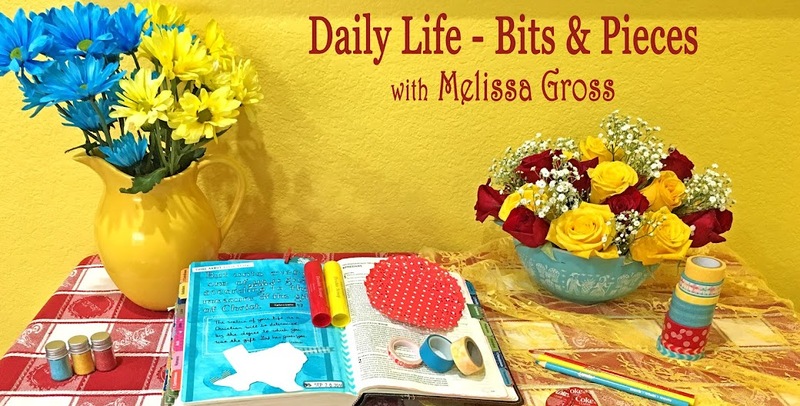 I will continue to blog here regularly about what's happening in my life, my latest scrapbooking pages, books I'm reading, stuff I'm organizing, and the fun classes I'm taking. 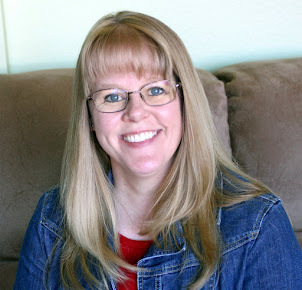 I'll also be participating in lots of fun blog activities like Sian's Storytelling Sunday 2 and Shimelle's Ten Things (this post is part of that activity - click here to see more Ten Things posts). One of things I've enjoyed most about blogging these past (almost) two years is making friends around the world! I so appreciate each of you who regularly visit my blog, leave comments, and even send snail mail that totally makes my day (like this surprise package I received from Rebekah shortly before Christmas). Thanks Rebekah - I know I've found a friend who understands me when she can't walk past a display of toe socks without picking out a totally cute pair for me! 7. Because I have received so much joy from the Mail Art packages I received (& sent) this past year, I will definitely be sending out surprise Mail Art packages throughout the year! 8. I will also continue to participate in the Library of Memories Community where we receive weekly challenges and encourage others who are setting up and maintaining a Library of Memories system. I enjoy the interaction with others who are also working to keep up with their digital workflow and photo organization in order to scrap inspirationally. If you've ever taken the Library of Memories or Finding Photo Freedom workshops and find yourself not keeping up with your system or lacking motivation, click here to sign up (it's only $15) and join us as we set weekly goals and share our own adaptations. 9. This year I am also planning to do some in-depth work in our home - organizing/decluttering and a little bit of redecorating/remodeling. 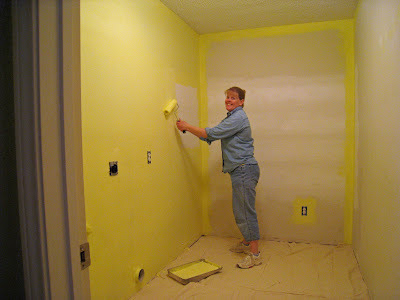 The first room is our laundry room, which we plan to start on before the end of this month. 10. And, as always, I will continue to strive for growth in my walk with the Lord by maintaining a daily quiet time, attending church regularly, and teaching Ladies' Bible Studies. I'm currently preparing to begin leading a study entitled Walking by Faith: Lessons Learned in the Dark by Jennifer Rothschild. I am looking forward to a fantastic year! What's on your top ten list for 2012? I know many families have a tradition of giving & receiving new pajamas on Christmas Eve, some simply to ensure that their Christmas morning photos look great. 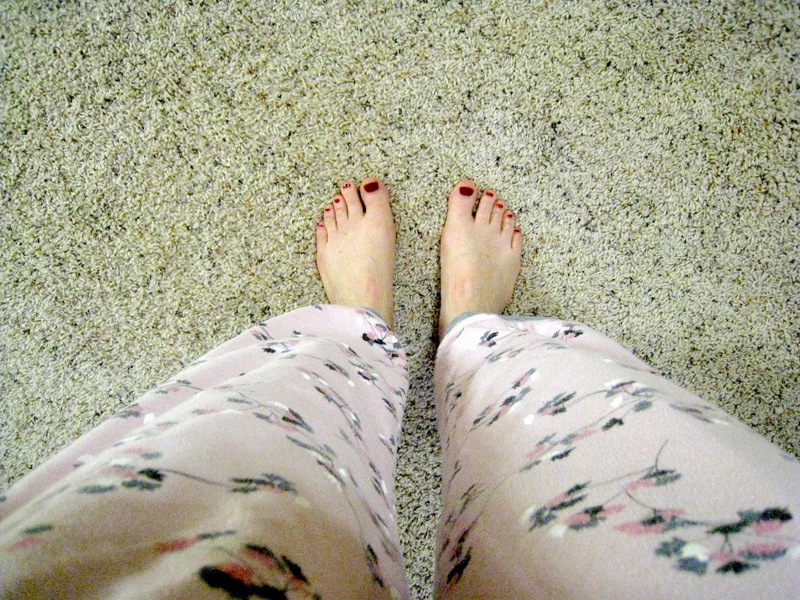 Since we were celebrating our 10th Christmas together (& 10th wedding anniversary 2 days later), I decided it was time for us to start a new tradition - new pajamas (or 'jammers as we call them) on Christmas Eve. 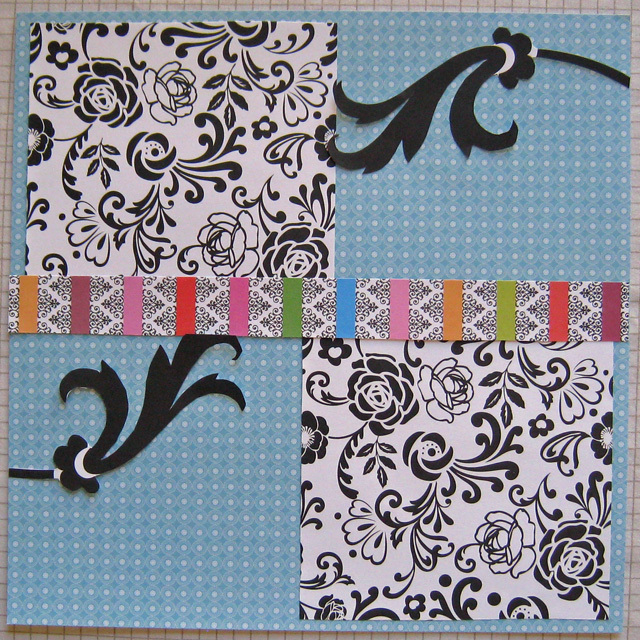 I didn't follow Stacy Julian's layout design since her page was 8 1/2 x 11 with one 4x6 photo and included a smaller 6x6 page that included four 2x2 photos. I did like the addition of the smaller photos, so I printed my photos here at home and put together a 12x12 layout. 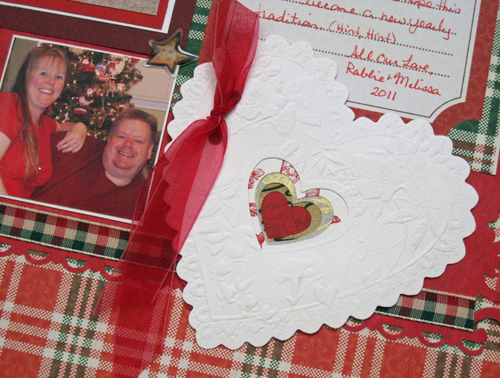 I really like the way this turned out and am so excited to use that heart embellishment, which has been in my stash for several years (since I took it off the front of a Valentine's card!). YIPPEE - I did it! I completed the entire 12 Days of Christmas workshop and now have 12 Christmas memories/traditions/ events preserved in my Library of Memories albums. Thanks so much for sticking with me - I've cleaned up all my Christmas papers & supplies and am looking forward to lots more scrapping in this new year! How about you? 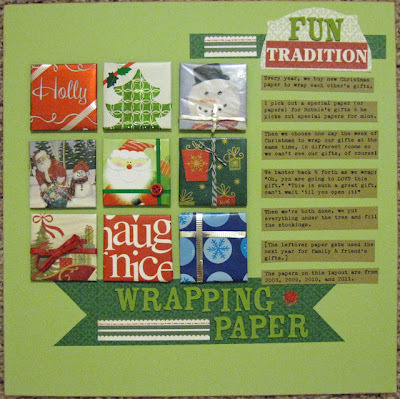 Are you still scrapping Christmas? The photo prompt for the 11th Day of Christmas was to take a photo of stockings displayed in your home and Georgana Hall's sample layout showcased those photos. However, since I'd already scrapped about our stockings (& the story of my big stocking), I simply scraplifted the layout design and chose a different topic. 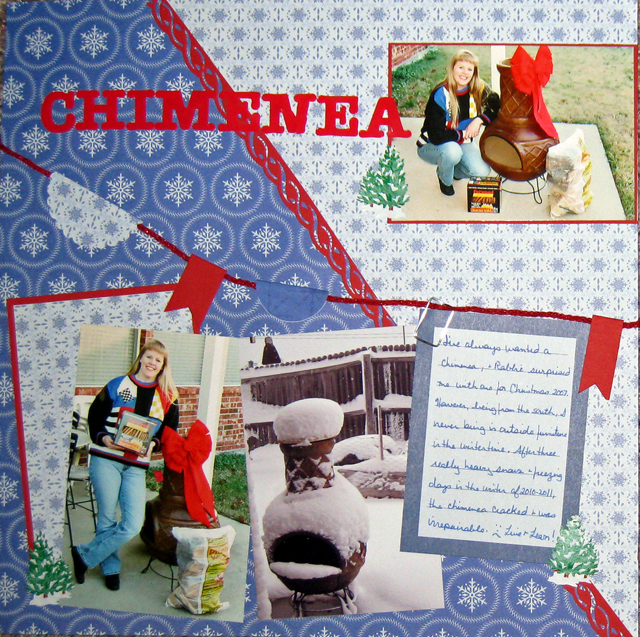 I used photos from Christmas 2007 when Robbie surprised me with the gift of a chimenea. I added a photo from last winter and a journaling block to tell my story. I know some of you have read about my Magic Cookie Bars before as I've shared the recipe and mentioned them in a few previous posts. 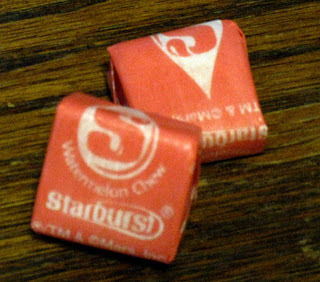 However, I realized that I had never scrapped my memories about this favorite treat. Nic's prompt to document a favorite treat for the 9th Day of Christmas provided the perfect opportunity. 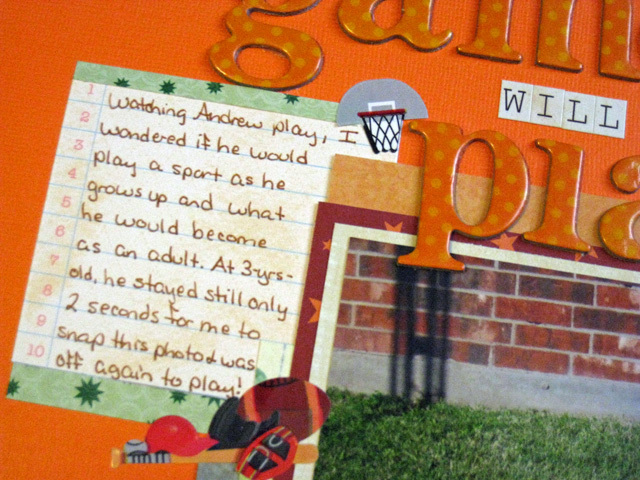 I included quite a bit of journaling, so I had to modify Nic's layout to fit that it all in. Journaling reads: *Many years ago I discovered an Eagle Brand Sweetened Condensed Milk recipe that has become a favorite with my family. It’s a fairly simple recipe as long as you don’t skip the “press down firmly with fork” direction (which enables the sweetened condensed milk to perform its “magic” and hold everything together). The recipe calls for 1 cup of chopped nuts – I always use pecans! *My favorite memory occurred a year or so before Robbie and I met. It was after a family BBQ at Mama & Daddy’s house in Groves. I was helping Mama clean up the kitchen while most of the family was still relaxing out in the back yard. There was one Magic Cookie Bar left in the bowl, so I leaned out the back door and asked if anyone wanted the last one. Luckily I had a firm grip on the bowl because several family members ran to get to the bowl first and grab that final cookie! As they fought over that last one, we all started laughing and I knew then that I would be making these Magic Cookie Bars every year for the holidays and other family get-togethers. *I remember when I lived near enough for them to visit often, Trey & Nichole enjoyed waiting for me to cut the Magic Cookie Bars & put them on a plate. They wanted to eat the crumbs (of graham crackers & chocolate & coconut & pecans) that were left in the pan! *One year during Christmastime when we were living in Hudson, I baked up a bunch of goodies to deliver to friends & shut-ins from our church. I packaged all the goodies for Robbie & I to deliver one Saturday. I placed two Magic Cookie Bars, a 5 dollar bill, and a tract on Salvation in a Ziploc bag. Robbie noticed the bag and asked who it was for. I replied that I had put it together in case we saw a beggar while we were out. Robbie laughed and reminded me that we were no longer in the Dallas area and we’d never seen anyone begging on a street corner since moving to east Texas. I was undeterred, however, and we headed out. As you might have guessed, we saw a beggar that day . . . of course, he was on the other side of the highway from where we were. I didn’t even have to tell Robbie to turn around! When we got back to the intersection, the beggar had already started walking away across a parking lot, but I was determined that the little Ziploc bag was for him and Robbie sped over to where he was. He seemed grateful (& somewhat surprised). I’ll never know what happened to those Magic Cookie Bars (I hope he enjoyed them) or the $5 (I hope it paid for some milk to go with them) or the tract (maybe it planted a seed that lead to his salvation), but I’m certain that something miraculous happened that day all because we shared our Magic Cookie Bars. 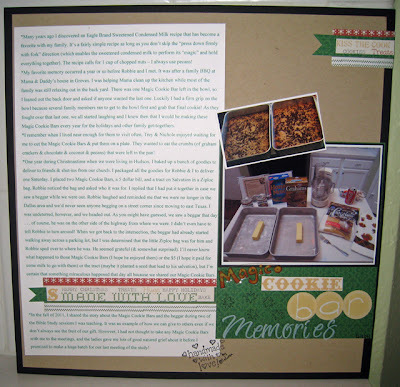 *In the fall of 2011, I shared the story about the Magic Cookie Bars and the beggar during two of the Bible Study sessions I was teaching. It was an example of how we can give to others even if we don’t always see the fruit of our gift. However, I had not thought to take any Magic Cookie Bars with me to the meetings, and the ladies gave me lots of good natured grief about it before I promised to make a huge batch for our last meeting of the study! 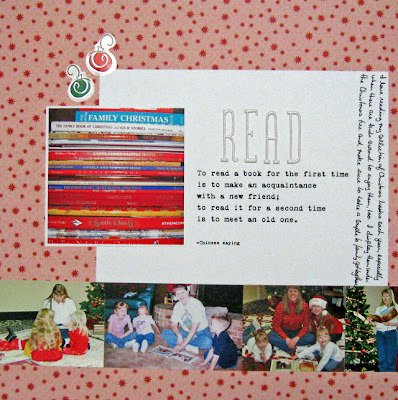 I loved today's prompt because I am a collector of books, and I have a fun assortment of Christmas picture storybooks that I display under the Christmas tree each year. I enjoy reading them, especially when there are children around to enjoy them too, and I have been known to travel to family get-togethers with a couple of them ready to read. I followed Elizabeth Dillow's layout exactly, including the quote & title. Then I added an extra row of photos across the bottom of my layout featuring the reading of some of my books. 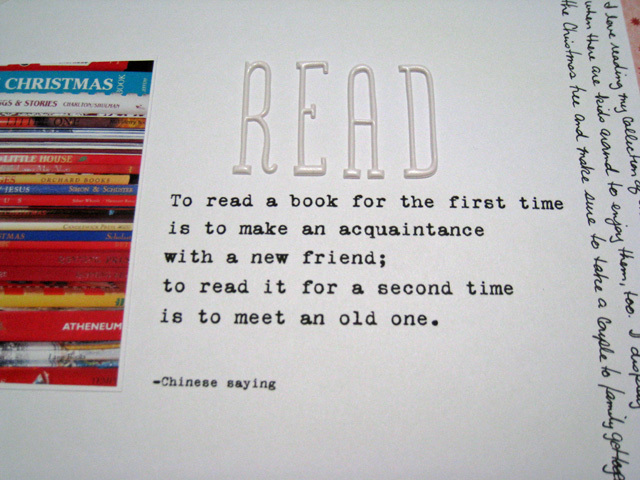 I think this quote sums up a good book very well. Of course, now that the holidays are coming to a close, I'm ready to put these Christmas books back on the children's book shelf in the guest room with the rest of my collection. Maybe while I'm working on that, I'll pull out a book and have a quick read, too! We're never too old to enjoy a good story.